With a resumé full of numerous exhibitions in Norway's most prestigious galleries, and with works decorating the walls in places like the Norwegian parlament, Statoil and the Norwegian cultural council, Bertil Greging is perhaps one of Norway’s most displayed artists. Working within the fields of painting, collage, drawing and installation, Bertil’s work is often described as chaotic and expressive, but also formal and minimalistic. 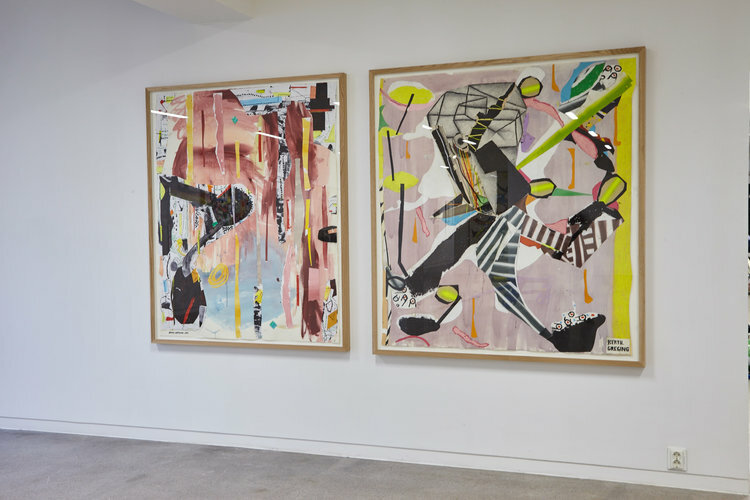 As the artist is born and bred in Oslo, the city itself — from its street lamps to bulky asphalt, pieces of an old flyer and the visual composition of soaring exhaust — serves both as an important inspiration and actual physical pieces in his works. Bertil’s most recent exhibition, No More No Less, is currently exhibited at the Oslo gallery, Rod Bianco. We gave him a call to hear whats up. Hello Bertil, how’s the exhibition going? The feedback from critics, other artists and the audience has been good. I’m perhaps most excited about the response from other artists, especially Bjarne Melgaard, who took a liking to my work. It’s thanks to him I’m at Rod Bianco Gallery — and gallery leader Gard Ekeli of course. I’m grateful. I do miss attention form big buyers though, like the National Museum and the general business industry. You are described as an artist that cultivates chaos, what’s that about? I wouldn’t say I cultivate chaos. Chaos is just a word for mess, and mess occurs everywhere; while I work and in life in general. However, I’m very conscious about my choices, and the compositions, proportions, colors, and the different lines in my work is characterized by structure and order. The works in this exhibition is a result from previous works I wasn’t happy with: I’d cut them up, tore them to pieces and then put those pieces together into greater and more monumental works. The result is exhibited in No More No Less. It’s a comprehensive, and at times, tiring process. My driving force comes from somewhere else than chaos. No More No Less has it’s last exhibition day on february 18.